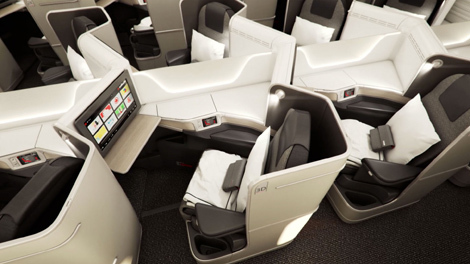 Air Canada has unveiled the cabin design and seating on its B787 fleet. The first such aircraft will be delivered in spring, and will start serving the Toronto-Tel Aviv route in July next year. The 251-seat Dreamliner will include three classes. 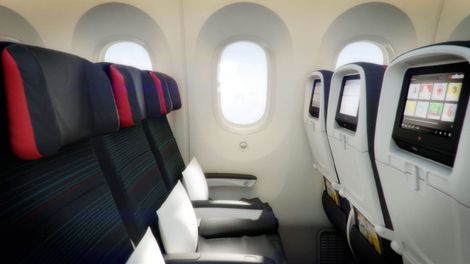 In its business class, there will be 20 seats arranged in a 1-2-1 configuration. There will be executive pods with a seat that can be extended to an 80 inch (203cm) long, 180-degree recline, fully flat bed. The headrest is adjustable and features a massage function. Each seat also contains its own touchscreen handset, universal power port, USB outlets, large retractable tray table and an 18 inch (46cm) seat back touch screen in-flight entertainment system with a wide variety of programme selections. Passengers can also enjoy freshly brewed Lavazza espressos and cappuccinos. 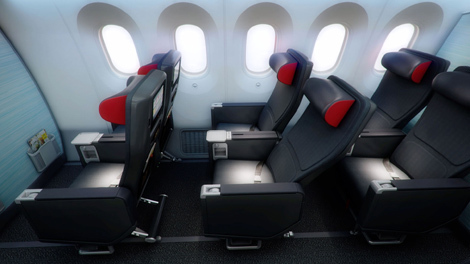 In premium economy, meanwhile, there will be 21 seats in a 2-3-2 configuration. The seat spacing will allow for 38 inches (96cm) of legroom, and feature a 19.5 inch (50cm) seat width and 7 inch (18cm) recline. Each seat is also equipped with an 11-inch (28cm) personal entertainment touch screen, as well as universal power and USB outlets. Passengers will be offered premium meals and priority check-in and baggage delivery at the airport. In economy class, there will be 210 seats arranged 3-3-3. Each seat will be equipped with a 9 inch (23cm) personal entertainment touch screen with a USB and universal power outlet within arm’s reach. The airline will take delivery of the first of 15 787-8 aircraft in spring 2014. The first delivery of 22 larger-capacity 787-9 aircraft, meanwhile, is expected in July 2015. All 37 Boeing 787 aircraft are scheduled to be delivered by the end of 2019. 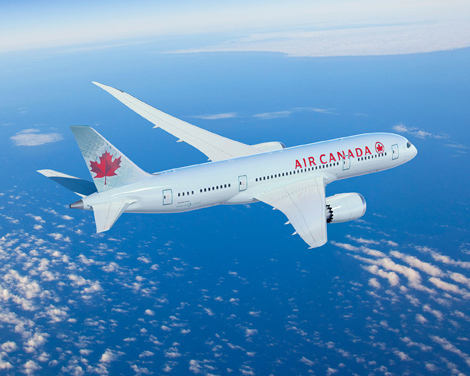 For more information, visit www.aircanada.com .